This is basically the wallpaper improved from my first. The scan and the title is the same but I've changed the whole design of the wallie. Hope that this REALLY is better than my first wallpaper of all. I've deleted the original one. Thanks to all for your support! Cool wall. I normally don't really like Gundam walls, since they are way too many, and most of them are plain bad. However, this one is actually quite good. I like the whole design of it, especially the words on the top. But one thinf you could fix it the border.If you are going to make a border, Don't put the scan on top of it. It really ruins the whole border thingy. Quote by RainOfStars.If you are going to make a border, Don't put the scan on top of it. It really ruins the whole border thingy. This is definaly a huge improvement from the previous one. I'm glad you didn't stuck to just filters. 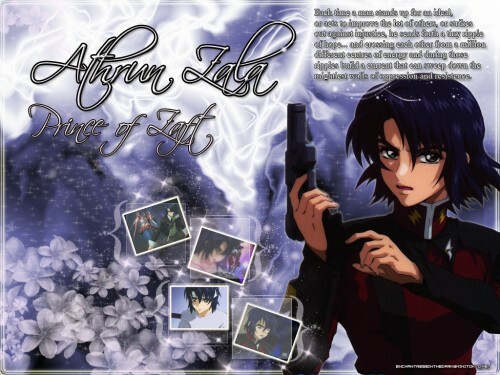 Again, I dislike the glow arond athrun. But I like the big white thingamajig. I don't know what it sis but it looks cool ^^ I have another suggestion though. You're using the font, flower brush, and sparkle brush too often. You should try out some new ones for variety. I love this wallpaper! Its gorgeous! I think that the wiritng shouldnt be touching athruns head though, actually if u scrapped the writing...then its perfect. It's great wallparper and nice picture. It's good job!!!!!!!!!!!!! Thanks for your background. d^_^b !!!!!!!!!!!!!!!!!!!!!! Quote by RainOfStarsCool wall. I normally don't really like Gundam walls, since they are way too many, and most of them are plain bad. However, this one is actually quite good. I like the whole design of it, especially the words on the top. But one thinf you could fix it the border.If you are going to make a border, Don't put the scan on top of it. It really ruins the whole border thingy. I love this wall! Its so beautiful! Hmm...Athrun prince of zaft though, if he had the orb uniform it would suit the background colours more maybe. Your wallpapers are amazing! Keep up the awsome work!!! Ah Nice!! I like this!! ehehe i like the way you put the images as if they were photo's and the usage of space. WOW! Such a cool wall of yours, Enchane-san ^_^ I love it and anyway, i will fav it for sure! and the whole wall is beautiful !